On August 12th the National Agricultural Statistics Service projected the Illinois corn yield at 172 bushels per acre. 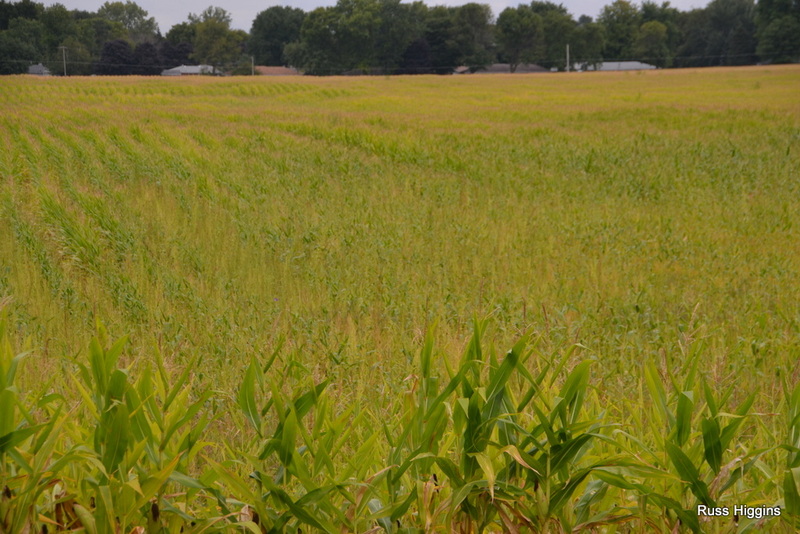 That, and better yields, will be harvested in many areas of the state. However, reaching that goal will be a challenge in much of northeastern Illinois. June rainfall totals that neared or surpassed 18 inches and flooded or saturated soils prevented root system development that would have allowed the crop to near its yield potential. I questioned Dr. Emerson Nafziger on the apparent early senescence of the corn crop in the northeast. He shared that while some earlier planted hybrids might be at or approaching maturity after getting the normal number of GDDs, for the fields that have some areas losing color and other parts that aren't, it's a sure bet that roots are the problem. He did not think they ever had the capacity (healthy roots at deeper depths, or even healthy roots well-connected to soil water at shallower depths) to take up water through even short periods of dry weather. A reminder that eligible producers have until September 30, 2015, to formally enroll their farms in the Agriculture Risk Coverage (ARC) or Price Loss Coverage (PLC) programs for 2014 and 2015. Previously producers elected one or the other program for each farm, or if no program election was made, the farm defaulted to the PLC program. Defaulted farms are not eligible for 2014 program benefits, but are eligible for potential 2015-2018 program benefits. If a farm is not enrolled for the 2014 and/or 2015 program year by September 30, 2015, the farm will not be eligible for acreage risk or price loss coverage. Please contact your local County FSA Office to finalize this step for the 2014 and/or 2015 ARC or PLC programs prior to September 30, 2015. I encourage anyone attending the Farm Progress Show next week to stop at the University of Illinois tent (Booth 34W) and visit with the Illinois Extension Commercial Agriculture Crops Educators. I will be joined by Dennis Bowman, Robert Bellm and Angie Peltier at the show.